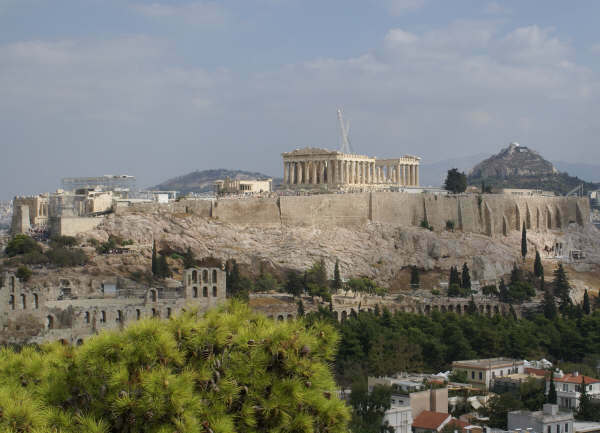 This is part one of the logbook that describes Bill Hone's bareboat sailing vacation out of Athens into the Cyclades, Greece. We pack our bags, check out of the hotel and board the taxi. Half an hour of riding south through the unbelievable Athens traffic gets us to Athens at the Alimos Marina near Kalamaki. Our sailboat, “Admiral III” is a 40’ sloop. She looks beautiful, even tied to the wharf. This is the biggest marina in Greece and it is huge - there are some 900 boats here, all scrunched together like sardines. However all is not well. The manager of the charter company has bad news for us. The other people who were to be part of our flotilla cancelled at the last minute and it is impossible to operate a “flotilla” of one boat – ours. We are shocked! Bottom line - the sailing experience we had contracted and planned for is cancelled. What to do now? Alternatives are suggested and mulled over. Finally the 4 of us decide we won’t cancel, we still want to sail. A group of 4 people from Hamburg is sailing another of the charter company's boats (an older 44’ Bavaria sloop named Hydra) for the same 2 weeks we booked. They’ve sailed in Greece for a couple of weeks annually during the past 10 years and this year they’re going south to the Cyclades Islands. At the owner's request they agree that we can tag along - with them acting more or less as our guide somewhat like the original flotilla leader would have done. If we accept their offer, we would essentially be doing a bare boat charter, a very different approach compared to what we originally bargained for. We would have much greater responsibility for the boat, our safety and for navigating among islands in an area of the Aegean we know nothing about. Also, the Cyclades Islands are less protected from wind and weather than the Saronic / Argolic islands where we would have gone. Overall, a significant challenge for us! Athens - Alimos Kalamaki marina offers 90% of the charter yachts in Greece. Joerg Hille comes over to our boat from Hydra and he and I have a brief discussion. He confirms their willingness to sail with us and agrees that we should all have a general discussion about how things would go under this arrangement. Over dinner at Vassilis Taverna, a short walk from the marina, we meet Joerg & Tina Hille and Gunther & Ushi Heyna. After dinner we all return to Hydra for a roundtable discussion over post-dinner ouzo. This goes well. We decide to do it … in for a penny, in for a pound (maybe more)! The official owner of “Admiral III”, a retired Rear Admiral in the Greek navy and the agent from the charter company give us a thorough check-out on the boat and all its systems. “A - III” was built in early 2008 and is well equipped as described below. It has some features and controls I’ve never used or even seen on any of the boats I’ve sailed. Jim says the same thing. 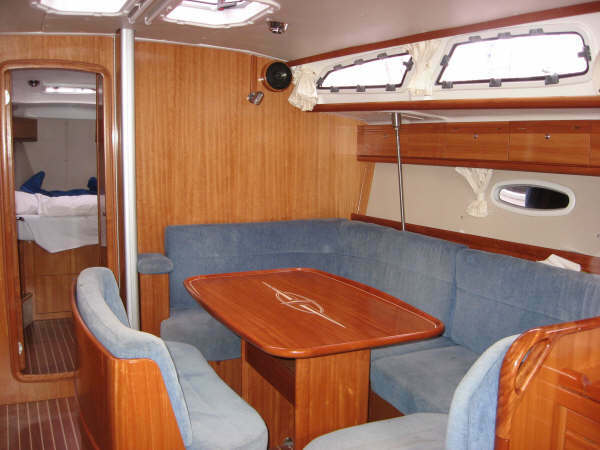 Bavaria, Beneteau and Jeanneau and Hanse are ideal yachts for sailing Greece. Roller furling jib and mainsail. All mainsail control lines are routed into the cockpit where several winches are located. Large canvas dodger and bimini. Both are foldable to expose the cockpit to breeze and sun. 8’ - 2.4 metres inflatable dingy with a 2 hp outboard. 3 cabins - one v-berth forward and two berths aft, one on each side of the engine room. Big salon with comfortable couch-style seating around a large dining table. Propane stove with oven and 230 V microwave. VHF Radio and GPS with chart display. Full set of Greek waters charts on which we can plot our various courses. Stereo system with CD capability. 2 steering stations with large wheels between which are a console with autopilot controls and instruments for wind speed/direction and water depth (the boat draws 1.9 m). Electrically operated, fold down swim platform (like a tailgate). Nice feature. 40 hp diesel motor that pushes the boat along at about 6.5 knots at 2000 rpm and which during our entire trip, burned only 164 litres of fuel. Purchase cost for this boat in Greece was about €135,000 or $225,000 Cdn. To bed on the boat at 11:00. Little sleep for me. I mentally review all the boat’s systems and feel some anxiety about the responsibility of being skipper given what we’ve decided to undertake. However in the end I’m confident that Jim and I have enough sailing experience to do the trip safely while learning necessary new skills as we go. We’ve done a major grocery shopping exercise at a nearby supermarket (bit of a challenge since nothing is labelled in English), so all we need to do now is a final check of the boat, make a final charter payment to our yacht charter agent and cast off. 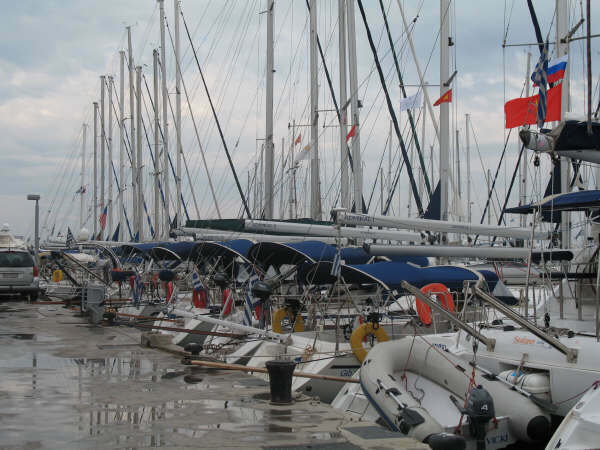 Boats are packed into this marina at 9 concrete piers, all tied stern-to in the Mediterranean way of mooring and separated only by inflated rubber fenders. It will take some care to get us free of this jam and look like we know what we’re doing. Besides Sounion (shorter), Kythnos is an excellent first port/anchorage if starting your sailing trip from Athens. At 10:15 we cast off and slip out of the mooring. It goes well. We rendezvous with Hydra outside the marina breakwater and get underway together. A good start! Our first destination is Kithnos - Kythnos on the northern edge of the Cyclades (pronounced keek LAD ees), about 42 nm away. We motor along in calm sea and little wind for about 1.5 hours. Then the wind begins to increase and becomes moderate. We turn upwind, set full sail and get the boat trimmed on a close reach. We soon get a feel for how our boat handles under sail and autopilot. We’re pleased with it. The wind continues to increase and the waves get bigger. We’ll eventually need to shorten sail and should do so before it becomes necessary. The jib furls easily and we leave about 50% of it out. However we encounter difficulty reefing the main. It requires simultaneous management of 3 lines – 2 for the roller furling mechanism plus the outhaul. Jim and Norah handle the lines while I try to keep the boat head-to-wind to ease side pressure on the sail. The skipper (that would be me) allows the boat to do 2 unintended “donuts” during this process, but we finally get the mainsail about 30% reefed and everything back under control. There was no risk since we decided to shorten sail early, but this was a good lesson in dealing with new systems while underway … different from doing it during check-out at the dock with no wind. Everyone is reacting to the rolling motion of the boat and we’re all feeling a bit “green”. Best to stay topside and keep the horizon in sight. To go below now would quickly induce nausea. How to prevent seasickness. We arrive at Kithnos harbour after 8-9 hours underway and drop anchor in about 15 feet - 4.5 metres of water. We decide on a light meal on board after rehydrating with liberal doses of Mythos beer. It’s been a pretty good start to our trip and we’re all pleased. We pack it in about 10. Up about 8:00 after a good rest. The day looks pleasant and all is well. Today’s destination is Serifos only about 22 nm away. Wind is forecast to be 3-4 on the Beaufort scale, a good breeze but not strong enough to make sailing rigorous. We look forward to it. After a brief discussion with Joerg and Gunther to coordinate our sailing plans, we hoist our anchor and get underway on a close reach at about 11:00. The wind is now lighter than forecast so we decide to motor-sail along the west coast of Kithnos making only 5 knots. Guess we’ll be about 4-5 hours getting to Serifos today. 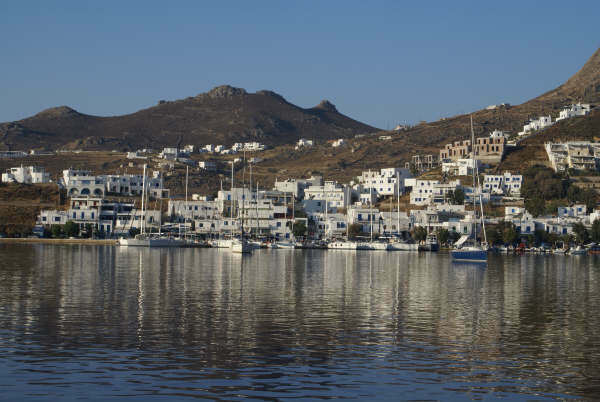 We arrive at Serifos about 16:00 and anchor in a fine protected harbour. Beer and nibblies in the cockpit, then we take our “rubber ducky” dinghy to town to replenish grocery and liquid inventories. After another drink and nibblies in the cockpit of Admiral III with our friends, we jump into the dinghy again and head to town for a late dinner at a nearby taverna. Back to the boat for a sip of ouzo and a bite of baklava. Sailing in Greece is turning into a nice experience. It’s a gorgeous morning – no clouds to mess up a perfect blue sky, but no wind either. Milos, our destination today is about 25 nm south. It is the remnant of a volcano which must have blown up leaving a big bay extending more than half way into the island to where the harbour is located. The sea is calm, deep blue and very clear. I’m not sure how far down we can see, maybe 50 feet - 15 metres. 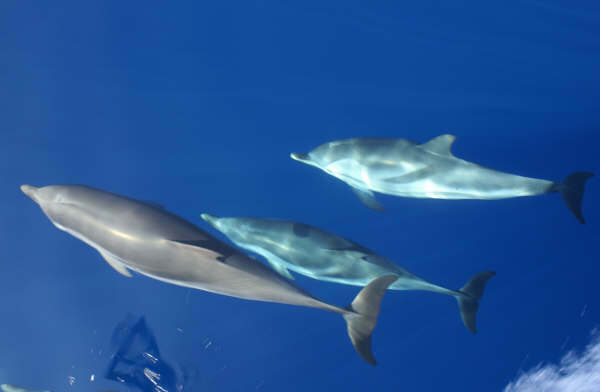 About half way to Milos, 10 or 12 dolphins discover us and decide to play in our bow wake for a while. Norah and I rush up to take pix. Suddenly they tire of us and streak away to play the same game with Hydra now running parallel to us about 300 meters off our port side. Wildlife, ancient culture and good food. Mid morning and we’re still motoring in calm wind and a flat sea. Our wind meter registers a negative value equal to our speed through the water, pushed as we are by the “iron breeze”. At about 12:30 we enter the long bay that leads about 4 nm further to Milos harbour and the town of Adhamas. An hour later we tie up to the pier and have a beer. It’s a very warm and sunny afternoon. After an hour or so resting and reading on the boat we all go ashore for a walk. Up many steps toward the highest point in town, along narrow streets past whitewashed homes and ultimately to the town’s church. 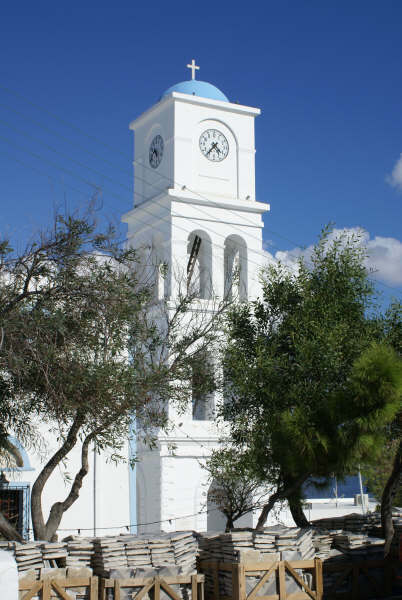 This is a typical Greek poster scene – a pure white structure with a blue dome and a separate bell/clock tower. 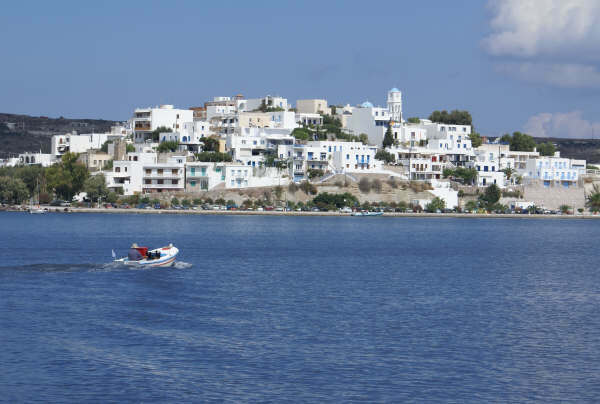 Southern Cyclades provide the best sailing holidays in Greece: Santorini, Amorgos, Milos and Astypalea. Back down to sea level, we walk about a km along the waterfront west of town. Lots of restaurants. Friendly people. One fellow is pounding a small octopus against a rock at the shore, presumably to tenderise its rubbery flesh. We return to the boat for a shower and then buy 24 hours of access to fresh water and shore power from a dock attendant. This lets us use the microwave oven and other electrical appliances without draining our batteries. We meet our friends, flip a coin to select a restaurant and settle in for a nice meal near the harbour. We agree to cast off at 08:00 tomorrow and go to Ios, some 50 nm away. To bed about 10:00, stuffed and happy.